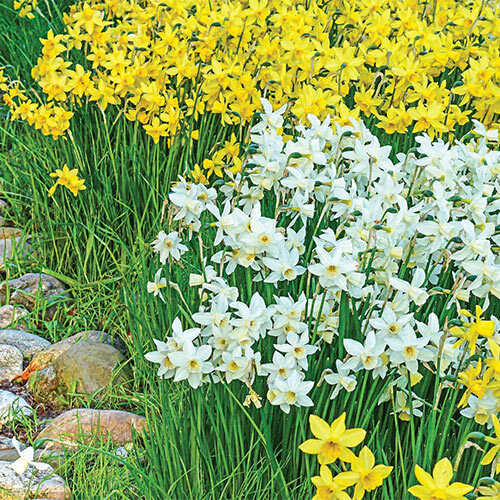 Plant this fragrant daffodil in borders and beds, and beautiful blooms, as well as butterflies, will fill the landscape in April. Each of Sailboat's strong 16" stems produces several small-cupped blooms of ivory white with pale yellow cups, making them a great choice for adding color to floral arrangements and cut-flower bouquets. Its lovely fragrance permeates the area around borders, beds and containers when in full bloom. Sailboat is a very showy daffodil variety that attracts butterflies by the dozens to the landscape. They are easy to grow and naturalize like a dream, coming back yearly with even more flowers than the year before. Deer won't bother this showstopping daffodil. Up to six 2.5" flowers per stem. Jonquilla daffodil.